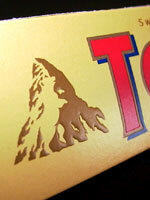 Peter Qviller, probably inspired by Camel Cigarettes article, spotted the hidden bear in Toblerone chocolate logo. Here’s what Peter said: “If you look closely on the Matterhorn mountain on the Toblerone chocolate, you will see the swiss symbol of Bern (a Bear) incorporated into the mountain“. I think the bear was supposed to be seen by people, but not many notice it. Can you see it? I’m not biggest fan of this chocolate, but this photo sure gave me inspiration to find some chocolate in my kitchen. Hope I have some, let me check… No luck :( There are few more logos that include symbolism. Remember we talked about Fedex logo, and the arrow hidden in it? Also there was Big Ten basketball confederation logo. It hid number 11, due to later added Penn State team. Mira foundation also cleverly included blind person into their sign. Never noticed that before. Cool one. That’s a cool one, never noticed. Oh i got that once for a friend years ago but i did NEVER noticed that one EVER! i never noticed this but then again it doesnt stand out much. not a good illusion. it doesnt even loke lik a bear! can anyone else see the face near the top of the mountain? it is very good. I love this site!!! It’s been there since 2000 and whoever says it doesn’t look like a bear must be looking at the wrong bit – it’s pretty clear. Looks more like a squirrel to me.. and would make more sense if it is a squirrel.. The reason I say it is a squirrel is cause it has a big bushy tail..
TOO EASY GOT THAT IN ONE SECOND! Yeah to me it looks more like a ferret too. Its the big ferrety tail that does it… seriously, why does the bear have a big ferrety tail? Is Bern some kind of mutant freak-bear? Or is he actually just a ferret? haha never noticed :D great! i always thought that was a porcupine not a bear! Okay, took me quite a while to notice it. The bear’s in the background! Concentrate on the yellowish part of the mountain. There’s a shape of a bear. Just one problem. Total Photoshop. I’m an expert in Photoshoppnessing, and have been doing it for about 85 years, and I have specialized knowledge (that you should take my word for) that proves these are fake. Omg wow i never noticed that haha . The reason the bear is contained in the image is that Toblerone was invented in Bern, Switzerland. The national symbol for bern is the bear. Bern is Swiss for Bear and in the centre of Bern there’s a bear pit. by !!me!! ps: vurdlak,do u think its funny? it looks like a sleeping Yeti. yeah it looks like a bear but if you look close enough it has a bushey tail so could it really be a fox? Looks a bit like a ferret! I wouldn`t really say its a bear- but its a cool illusion! I don’t see the bear, but I do see what looks like a very … *hehem* large person in profile, eating a square of something… probably toblerone. ^_^ … look at the cream bits in the mountain. … oh wait… I see the bear now!